General Information for Ordering for Purchasing Departments. The sale of our products is restricted for use in laboratory research only. The products are not for use in diagnostic or therapeutic processes. Our products are not for resale. There is no minimum order requirement. Confirmation for all VAT exemption orders is required. For initial order placement customers have to register to open a Customers account. Assent to our Terms & Conditions of Sale is made with the order. A copy of Terms & Conditions of Sale is provided on the reverse side of each offer and invoice and/or can be obtained from our Customer Service (cusserv@hypermol.com or call ++49 521 98 76 228). Prices are quoted in Euro (€) and are subject to change without notice. All prices quoted are exclusive of VAT, delivery or any possible other fee or charge. Payment terms for purchases are net 30 days. All orders are subject to final acceptance by HYPERMOL EK at the prices in effect at the date of order. Orders are based on our terms and conditions of sale appearing on the reverse side of each offer and invoice. Orders are usually shipped within 1 day from date of order. For the benefit of the goods, overseas orders are not shipped over the weekend.. Once a shipment has been released to the carrier, the Customer becomes the owner of the goods. The customer receives an Email from our CustomerService containing the shipping code. Thus the order can be traced by the Customer to estimate the time of delivery. 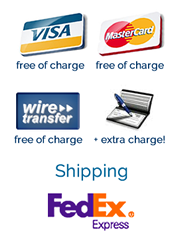 Express shipping, packing and insurance charges are prepaid by Hypermol and will be added to the invoice as a flat charge. .
For questions about ordering, you are welcome to contact us.